HTC financial results find a new bottom every new quarter, but the company is not giving up and keeps pushing new phones. We saw the U12 Life midranger at IFA in Berlin and it looks like we might see even more affordable smartphone. 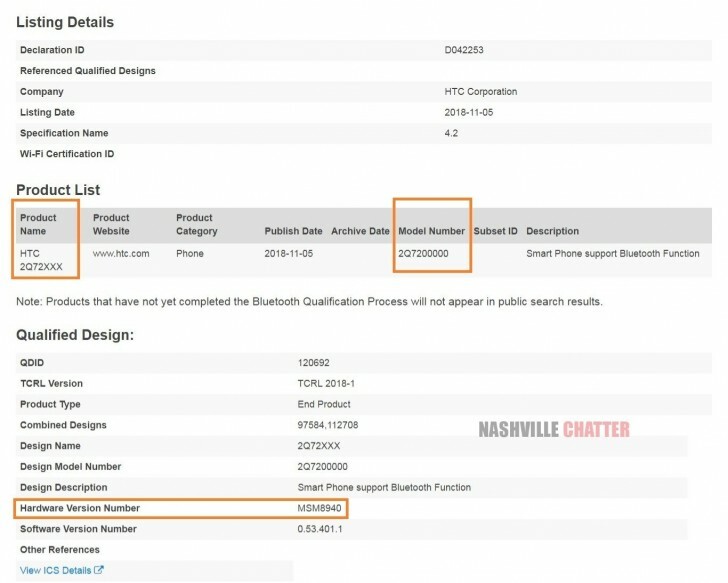 A device with the model number HTC 2Q72XXX was just approved on Bluetooth SIG website, revealing a Snapdragon 435 chipset. The Qualcomm SoC dates back to February 2016 when it was introduced along two other chipsets. The 435 is built on the even older 28 nm process with eight Cortex-A53 cores, clocked at up to 1.4 GHz. There is an Adreno 505 GPU and a modest X8 modem with a Cat.7 connectivity of up to 300 Mbps. Going for flagships in the past two years did not prove a successful solution in the past two years, so the Taiwanese company might be switching to the affordable segment. There is also a slight possibility HTC is just certifying test products that have nothing to do with the smartphone market, so we have to wait and see. Snapdragon 435 -where and what time they are living?! Holy s.it! Useless. It's very simple HTC, take the M7 design, remove the htc bar and make the screen wider, put the latest specs inside and voila, you have a bestseller flagship.